As area residents honored relatives and friends on Memorial Day during Oklahoma’s statehood centennial year, it is interesting to take the time to learn more about some unusual cemeteries and tombstones in Lincoln County. Chandler’s first dedicated burial place dates from 1892 and is one of the oldest in the county. It is located on the north edge of town on the old A. D. Wright homestead, and is difficult to access. It is located west of the railroad tracks. Access is gained by crossing private property north and east of Chigger Road, a Chandler street. It is located southeast of the old Howard Johnson’s Restaurant in north Chandler. The cornerstone was opened when the old courthouse was torn down in 1968. The contents (including the old cemetery map) were preserved in boxes by County Assessor H. C. Boots Oleson. Notes by Wright at the county historical museum state that Tabitha Baker bought a lot there for William Baker. 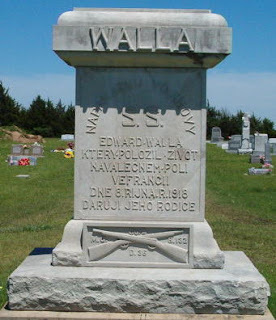 Wright wrote that Baker was “her Kickapoo outlaw husband”; however, no marker or other record exists to prove he is buried there. As late as 1966 a rounded wooden tombstone was stuck in the soil to mark a grave there, and another burial plot was marked with a baby crib made of thin metal wire. Some historical records state that a baby, her brother, and mother are buried in this cemetery, supposedly all killed in the 1897 cyclone that destroyed much of Chandler. Today the three-acre cemetery is fenced separately to keep livestock away from the headstones. A solitary gravestone sits inside a wire fence a few feet from E. 15th Street in Chandler. Most passersby do not know it is there, about 300 feet east of the Southern Baptist Church. 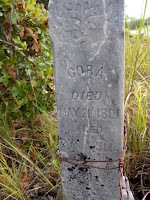 The granite pillar tells us it is the final resting place of two children of A. B. and M. J. Cardwell, who were buried there in 1891--apparently before the land was opened for settlement. Cora died May 21, 1891 at the age of 2 years, 5 months. Winnie died May 13, 1891 at the age of 3 months, 13 days. 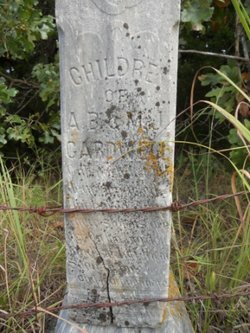 The Sac and Fox Reservation was not opened for settlement until September 22, 1891, so the burial of the two little girls in May forms the basis of a mystery. Sac and Fox Cemetery is located on the eastern edge of the tribe’s headquarters at the site of the old Agency on S. H. 99 south of Stroud. It is accessed by a county road east of the highway and is within eye-shot of the original water tower framework. It contains the graves of several chiefs, including Moses Keokuk. Buried there in 1903, the name on his gravestone is spelled “Keokkuk” with two k’s, perhaps a mistake by the stone carver. Veterans of wars, from the Civil War through the Persian Gulf War, are buried in cemeteries all over Lincoln County. Often their tombstones reveal details of their war service. The bronze marker of Marcellus J. Newman in Meeker’s New Hope Cemetery bears the distinctive symbol of the Congressional Medal of Honor he was awarded for heroism in the Civil War. Silas Gordon’s marker in Wellston Cemetery tells us “He Wore the Blue,” and Reed Thomas Foster’s gravestone in Rossville Cemetery reveals he was awarded five bronze stars for battles fought in Normandy, Northern France, Ardennes, and the Rhineland in World War II. Oak Park Cemetery in Chandler contains graves of two women whose headstones tell of their service in two wars. Nellie Mary Parker was a volunteer nurse in the Spanish American War and Lillian B. Mix was in the Army Nurses Corps in World War I. Several graveyards in Lincoln County are predominately the burial places of black people. This includes Keywest Cemetery southeast of Stroud near the Creek County Line. A few feet inside the front gate is the white tombstone of Tobias Lewis who was 108 years old when he died in 1909. The names of the founders of Booker Cemetery Association south of Davenport are inscribed on markers on the gate post columns. The names include black people from throughout the area. Most of the tombstones in the Czech National Cemetery south and east of Prague reveal that they are the final resting places of those of Czech heritage. 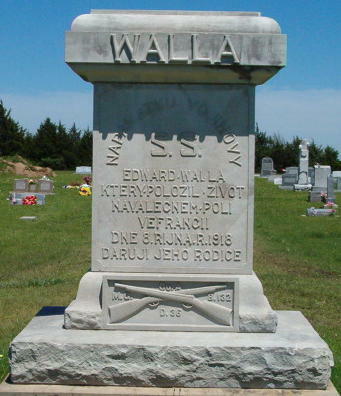 The massive memorial to Edward Walla, killed in World War I, is particularly poignant because every word on its face is in the Czech language. Cemeteries are scattered across Lincoln County’s landscape and some of the oldest have been abandoned or lost to the elements. Luckily, most burials have been officially recorded, and those cemeteries still in use have many tombstones that tell interesting histories of you take time to ready them carefully. 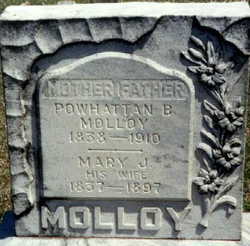 Gravestone of Powhattan B. Molloy and wife Mary J. The name may ring a bell because Powhattan was the Indian chief who figures in the history of Jamestown, the first permanent American colony in the New World, whose 400th anniversary was celebrated April 16. It's a great county that has a Powhattan of its own, and probably an Irishman to boot!